We’re not big breakfast eaters during the week, but weekends sometimes call for something baked and delicious to accompany our morning cappuccino. I posted a pear and cheddar scone recipe a few months ago and as I was fantasizing about how good they were, I started looking around the kitchen to see what what ingredients I had at hand. The blueberries in my freezer and ripe bananas in my fruit bowl were screaming to be used so an hour later we were enjoying warm and buttery blueberry banana scones. I used a slightly different recipe for this batch and they were equally as delicious. This dough was little more crumbly than the previous one. When you make these scones, work the dough only enough so that it holds together. After you form the circle and cut the dough into 8 wedges, use a pie server to lift the scones onto a baking sheet. This should prevent the scones from falling apart. I prefer frozen blueberries for this recipe and when you add them to the dough, mix with care so you don’t burst them. Because of their nutritional value, I try to use blueberries as often as possible. Aside from their delicious taste, they make any food more appealing with their deep purple color. 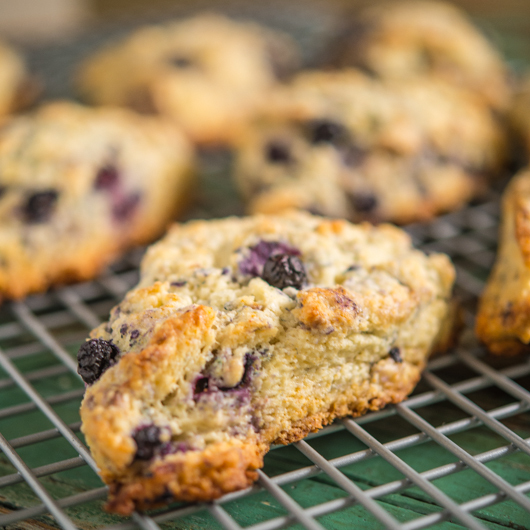 Try these scones and let me know what you think. 2. In the bowl of a food processor, pulse together flour, sugar, baking powder, and salt. Add butter and pulse until mixture looks like course grains. Some pea-sized pieces of butter are fine. Transfer mixture to a large bowl. 3. Add blueberries and carefully combine. Mix banana with cream and add to flour mixture. Carefully mix to not break the blueberries. Work the dough just enough for it to hold together. Transfer dough to a floured surface. Form the dough into an 8 inch circle and cut into 8 wedges (like cutting a pie). 4. Line a baking sheet with parchment paper and place scones on sheet, spacing 2 inches apart. Brush scones with egg wash and sprinkle with coarse sugar. 5. Bake for 25 to 30 minutes or until golden brown. Serve immediately. These were simply wonderful with fresh picked blueberries. I took a hot one over to my neighbor and she called and left a message later saying it was “simply divine”. Barry heard the message and said he would second that. Keep posting Bill. We really enjoy!! Going to make these in the morning with fresh picked blueberries from my bushes. I will let you know how they do.